For 15 years, On Deck Sports has been a leading provider of batting cages. We carry all the essentials you need for a great batting cage, from netting down batting cage turf. Our turf is a low-cost, high-quality way to give your cage a professional look while extending its life. 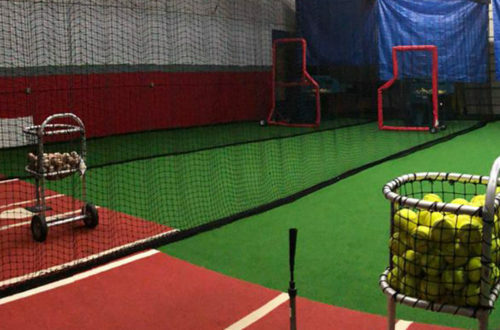 Batting cage turf is perfect for any batting cage. It does not matter if your cage has a cement, dirt, grass or any other base – our turf can cover it and give your players a consistent surface to hit off of. We have three suggested options: BCT, PM34 and Cage. All of these options are unpadded turf and can be glued down on cement or grounded with turf spikes. Our turf comes in 15-foot rolls that can have nearly any length. The exception is PM34, which comes in a 12-foot wide roll. Standard batting cage lengths that we have dealt with in the past are 35′, 55′ and 70′. BCT is our most popular batting cage turf option. It is a durable, long-lasting option that can withstand the abuse of your team or players hitting off it on a consistent basis. At just $1.25 per square foot, BCT is a great value for any batting cage. PM34 is a great option for anyone looking for a softer turf option. It’s high-quality has a softer feel than other options, but can still withstand heavy use. PM34 will give you a professional look for just $1.49 per square foot, a great value for the quality of turf. Cage is our most durable turf option for batting cages. This is because it is made with nylon yarn. It does not have the soft feel, but will hold up to nearly anything you and your players can throw at it. Cage is available for just $1.69 per square foot, a great price for this durable, long-lasting turf option.